Pakistan is the 6th most populous country in the world and 70% of our 180 million population is under 30 years of age. Internet penetration among the masses has increased considerably over the last four years to 17.8%, with 13.5 million mobile broadband subscribers, and 125 million mobile phone subscribers. This boils down to the fact that Pakistan has a largely younger demographic with internet connectivity which makes them well-equipped to solve issues particularly through the use of technology. Earlier this year, Bloomberg declared the Pakistani Stock Exchange as the best of the Asian Market which led American stock index MSCI to reclassify Pakistan from Frontier Markets Index to the Emerging Markets Index. 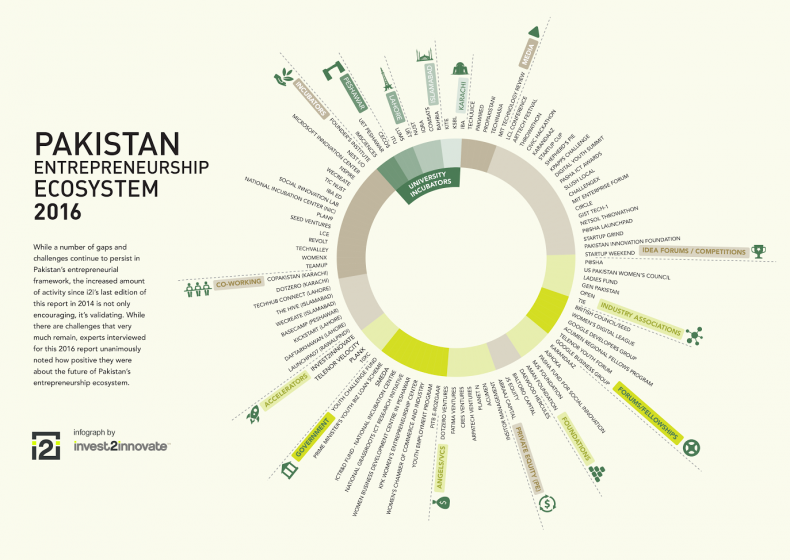 Furthermore, the UNDP says that 23% of Pakistan’s youth want to start their own businesses but lack proper guidance. The local startup sector has witnessed a boosted primarily due to a global push on developing more robust entrepreneurial ecosystems. Pakistan’s startup industry is still nascent, to say the least. So the question arises what can be done to improve the situation and provide budding startups with the right facilities. Exploring these grounds is Invest2Innovate, Pakistan’s leading startup accelerator. In a follow-up to their 2014 edition, i2i is back with their Entrepreneurship Ecosystem Report 2016 which deals with the advancements that have happened in the startup industry, areas that still need improvement, and the gaps and challenges which exist for entrepreneurs in the country. Corporations need to play a big role in supporting young Pakistani startups. In a very thorough manner the report analyzes the developments on initiatives from government, foundations, corporations, investors, universities, and entrepreneur support organizations. The government has been taking steps to promote entrepreneurial activities in the countries and recently announced that they would be opening the National Incubation Centre in 2017. The report notes that there is no inclination towards philanthropic grants in Pakistan and most startups tend to apply for grants from other sources like the MJS Foundation, Aman Foundation, P@SHA Fund for Social Innovation, Pakistan Acumen Fellows Program, and others. Corporations have a big role to play in supporting young Pakistani startups whether it be via funding or via support on value chain and service delivery of their products or services. Earlier this year, Telenor Pakistan introduced Velocity, their go-to market startup accelerator, Mobilink is supporting the new National Incubation Centre, while Unilever, Coca Cola, and Engro Foods are also involved in projects to support Pakistani startups. While the increase in angel investors is encouraging, it is also important to increase their knowledge and understanding of investment, particularly for those who are first-time investors. Angel Investment has also gained considerable traction since the last report with five angel funds surfacing in this time. However, the ecosystem for angel investment is still developing and there is a pressing need to educate both investors and startups. Similarly, there is a need for more venture funds to operate in Pakistan to close the early stage capital gap. But the report reveals that lack of regulatory framework and weak pipeline inhibits most investors from launching venture funds. In order to expose startups to investment opportunities, startup incubators and accelerators are trying their best to do a good job but still a lot more needs to be done. There have also been related developments at university level due to added pressure from the HEC. However, university incubators still need to be strengthened quality-wise so that they are not mere empty spaces. HEC has set up business incubation centers at various universities but many of these centers continue to function as empty spaces without real support or entrepreneurship-based curriculum for students. To sum up the Entrepreneurship Ecosystem Report 2016, the overall trend shows that there are more support players, more initiatives, and more investors than before. However, work needs to be done to improve the quality of the existing initiatives and efforts need to be directed toward increasing angel funds and private equity players. Moreover, while the increase in angel investors is encouraging, it is also important to increase their knowledge and understanding of investment, particularly for those who are first-time investors. To study the findings in detail, you can find the complete report here.